I waited two days to write this review and now that I am sitting here...trying to put my thoughts into words, I have to admit this might be one of the hardest reviews for me to write. There is so much heart in this book. 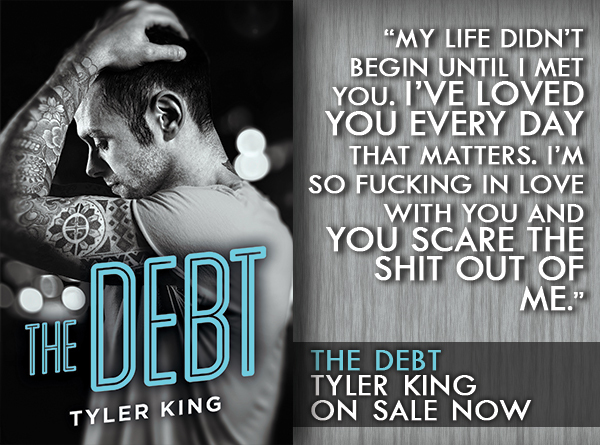 Tyler King, a first time author, put so much emotion into the characters and built up the story from the very first page. It was impossible to untwist the past between the main characters, all I could do was hang on for the ride. The plot isn't unique, the two main characters have some serious issues that have caused a gaping hole in their relationship, but it is those same issues that pull them back together and it is the method in which Tyler King weaves their story that is unique and addictive. Josh's past is inked onto his body, he puts all his effort into his band, and what little effort he has left goes into finding the next chick to use. His friendship with Hadley is hanging by a thread, they may be roommates and share all their friends, but she doesn't know his biggest secret. He knows he's probably ruined every chance with her, especially after he let his panic win and he ran out on her when she needed him most. He's willing to do anything to fix things with her, he'll never let her be alone or afraid again, but he's not willing to tell her everything, to break her even more. He wants her to be his, even though it may be too late, he's going to do whatever it takes to repay her the debt he owes. "Just know that I'm sorry and I didn't meant it. I'd take it back if I could." Told from the POV of male main character, Josh, we are introduced to his lifestyle of ladies, anxiety, music, and a dysfunctional friendship with roommate Hadley. Their friendship is forged over years of foster care, new homes, and a terrifying event that changed Hadley forever. They take care of each other to the best of their abilities and together work to face their fears. I really liked that both characters were so flawed, but unwilling to see those flaws as bad parts of one another. While they were both enablers, I could see the love they shared for each other as both roommates and friends. The dialogue between those two was at times serious and at times hilarious, they shared a bond that was visible to anyone. The emotions between these two was palpable, not just the chemistry, but every feeling they had about one another. As they sort things out, I rooted for them, for Josh to finally face his past and for Hadley to own her problems. I really enjoyed them as individuals and especially liked them together. There are also some incredible secondary characters and secondary plots that are worth mentioning, from Josh's band mates to Hadley's friendship with Andre. Each new character and new plot was a layer on their lives that allowed me to see outside of their home and their shared issues to build a world around them and see how their friends looked at them. I really loved the changing timeline in The Debt, which was a surprise even to myself. I liked reading the past, the present as a college student, and Josh's visits with his counselor. It was easy to get into Josh's head, get to know his personality, and look at the world from his perspective. I found the style of writing really interesting, with King only giving the reader just enough to know they're missing an important part of the story. The topic of this book, especially in Josh's life, are heavy and dark, but he is a self-aware character that talks himself, and the reader, through each pit he falls into. I liked reading just his POV, I felt like it was a fresh look at the topic of anxiety and panic disorders. It is incredibly hard to read about his past, I struggled through it, but it was worth it in the end, watching him finally develop and grow as a character was such a breathe of fresh air. "It ain't stuck, son. What you laid down in there is all heart and hate and deep soul-searching questions that only have answers in the notes..."
As stated before, this book has some extremely heavy topics that it works through. As a reader, I think it is worth mentioning that I felt myself getting uncomfortable with some of Josh's antics. There is a lot of flippant hooking up, that is really important to the main character's development, but may come across as excessive. The book though, is inspiring and full of wisdom, I connected with it in so many ways, but it was at times hard to get through. Around 50% I thought I'd read a full book and while I am thankful I stuck it out I can see this being a drawback for some. It is a very complex book, it isn't a traditional New Adult, and while it is very good I think that is worth noting for readers looking for a traditional, easy New Adult. "I wouldn't correct on single mistake. I regretted not one regret." 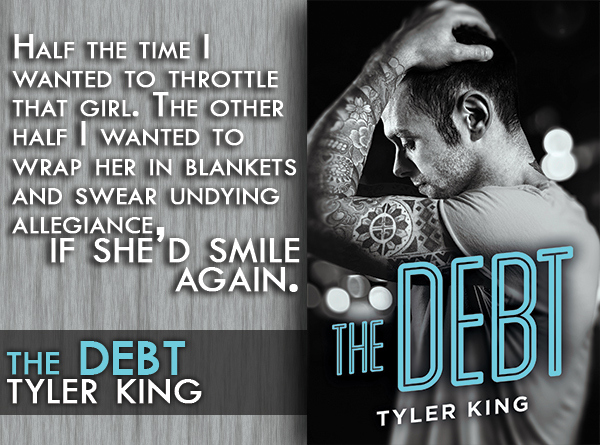 If you are looking for a romance that's filled with angst, complex characters, and an intricate plot, then you need to pick up The Debt. The focus of this book is broad, covering not just the romance of two characters, but also mental health, friendship, and healing. I was really impressed with this book and recommend it, across the board, to everyone.